From high on a rooftop, I am treated to a spectacular view of Durbar Square Patan, the third and final Durbar Square in the Kathmandu Valley. Like many from this area, my tour guide today was very knowledgable and had a great command of the English language. Today as with other days, I was taken to sacred sites both Buddhist and Hindu. 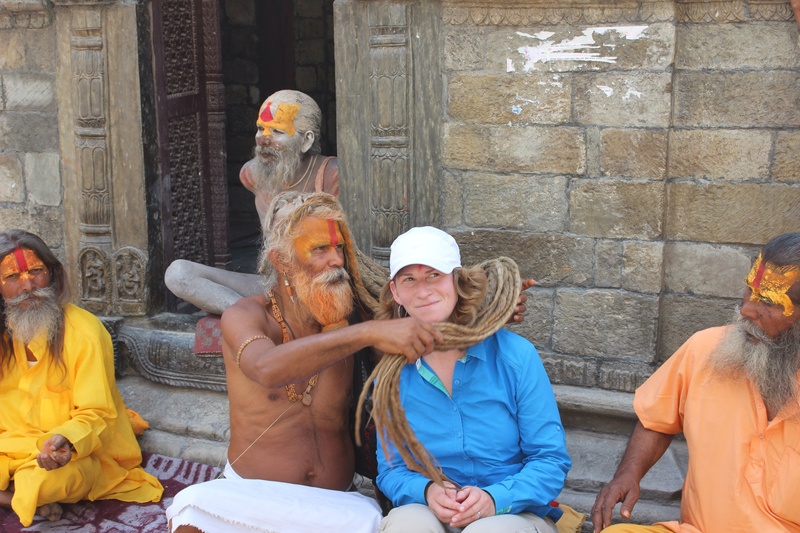 Everyone in Nepal stresses the harmony between all inhabitants regardless of their religion and it is certainly and obviously present in all the places I’ve been. 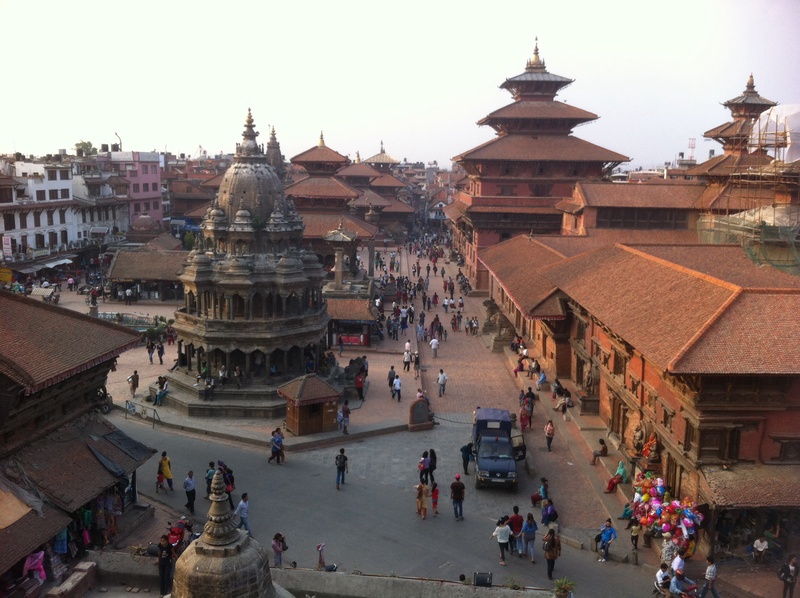 Like the others, this Durbar Square represents a kingdom of times past. The kings of these places would build their towns very close to the royal palace so they could communicate and keep and eye on the people. Each royal palace has many windows they call eyes. From the inside, it is easy to see out, but from outside, one cannot see in due to the intricate woodwork. The Nepalese are very fond of festivals and in the middle of the square, there is a huge bell that can be heard for a one kilometer radius, and was used to call the people for any news, emergency, or festival. The Hindu Trinity is represented by the Gods Shiva (God of Destruction & Rejuvination), Vishnu (God of Protection), and Brahma (God of Creation). My guide told me when The God Shiva wanted to go someplace, he took the golden bull Nandi, that is why Nandi waits outside every temple to Shiva. He said “Just think of him as Shiva’s motorbike!” Also, the God Vishnu has Garuda, a bird like creature he rides, or turns into. Vishnu is often pictured as half man, half bird, a figure which is present in both Hindu and Buddhist mythology. 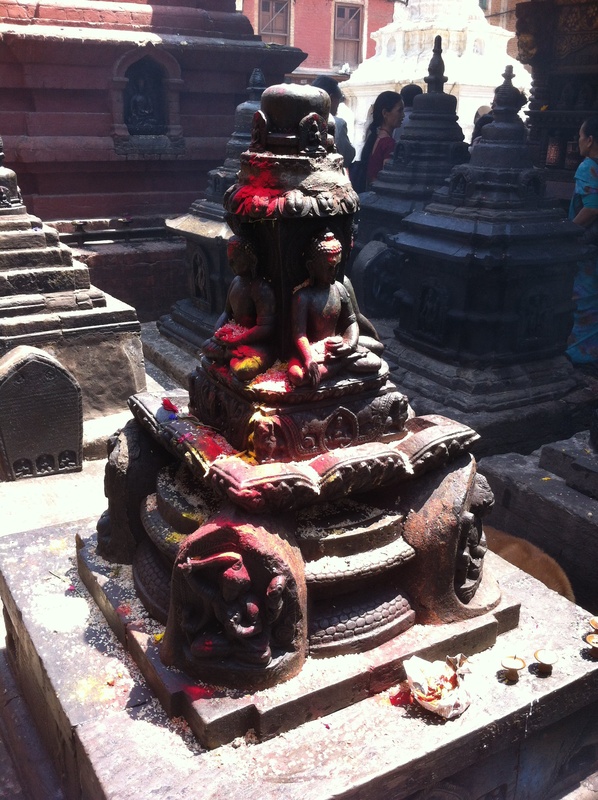 As I walked around, I saw many Hindu women praying to shrines of Ganesh, who is one of the forms of the God Shiva. Ganesh is depicted as an elephant and represents wisdom, good luck, and long life. The women are there praying for long life for their husbands. Saturday morning in Kathmandu. I don my Nepali pollution mask and hit the streets. 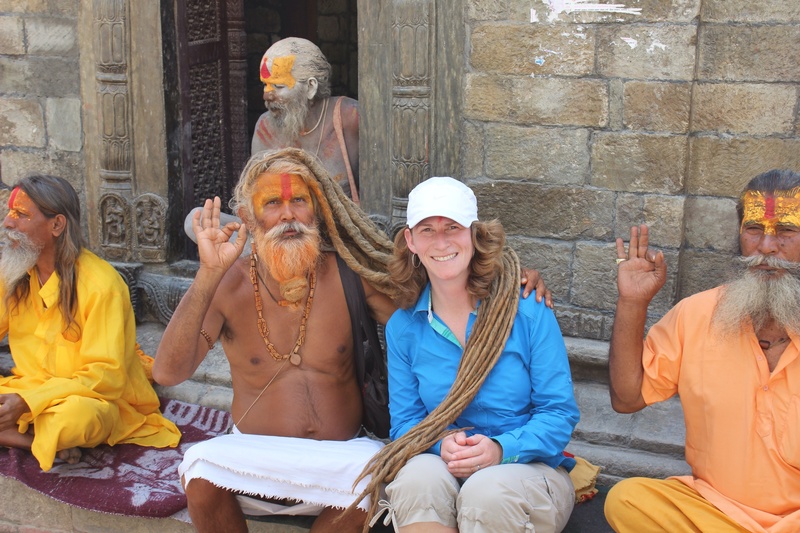 I walk a few blocks away from my hotel, hire a rickshaw and head to the Monkey Temple. We’re basically 4 wheeling in a 1960’s bicycle with cart attached and on several occasions I’m more than glad we don’t go over. My driver has very strong legs and we make it up some impossible hills. Then he drops me off, points in a general direction and commands “walk”. SO, I head over some hills and up some steps through a stupa (temple), around some chickens, over some boulders and up a dusty street till I can see a big temple atop a hill. By my estimation it’s 30 minutes walk and I’m just guessing it’s where I’m supposed to be headed. 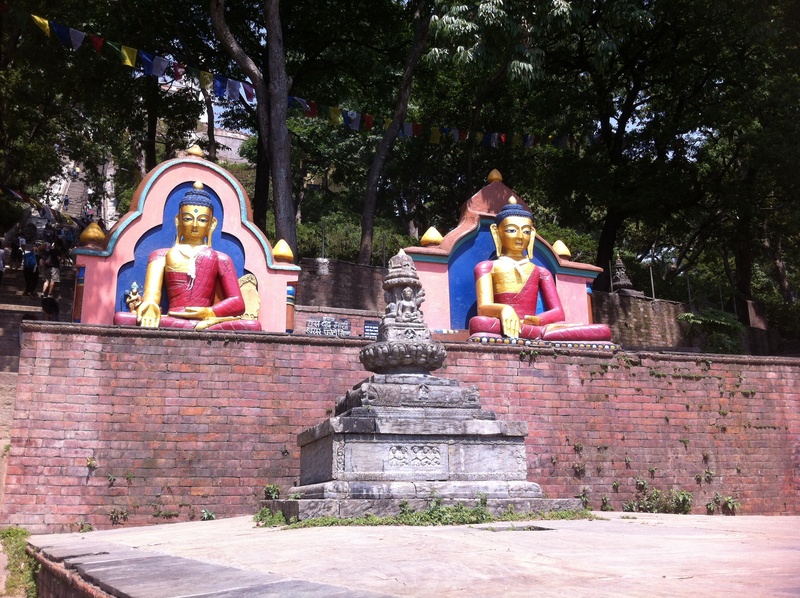 Saturday is the Nepali day of rest and worship, a time families spend together in the temples and parks. It’s a beautiful day already and as I approach the temple I can see the infamous stairs that lead to the top. What I don’t know, is that I can only see the first half of them! The Nepalese are walking fools. Climbing too. Even here in the Kathmandu valley. I consider myself a pretty motion oriented human, but I am already suffering several blisters and other wear and tear from the walking that to them is a leisurely stroll. Good thing I have a week and a half before I head to the mountains! As I begin the ascent, I can see many huge painted statues of deities. And then, the monkeys arrive: playing and running, hanging on their mothers bellies as they race across the steps, doing both animal and human activities. It is obvious they have been watching the visitors and have picked up a few things. There are pools/ponds everywhere for them and they lean into the water and hang upside down to drink. One monkey has half a water bottle he is using as a cup, dipping into the water, then sitting up and drinking like a person. There are lots of tourists from all over the world, but the majority of people here are locals who have come with their families for the day. Locals and tourists alike rest along the way as we climb the steps. There are large carved stone sculptures all the way up and as we get higher we begin to see the bright gold metal work of the entrance glistening in the sun. To either side there are many prayer wheels moving as each person spins them on their way by. 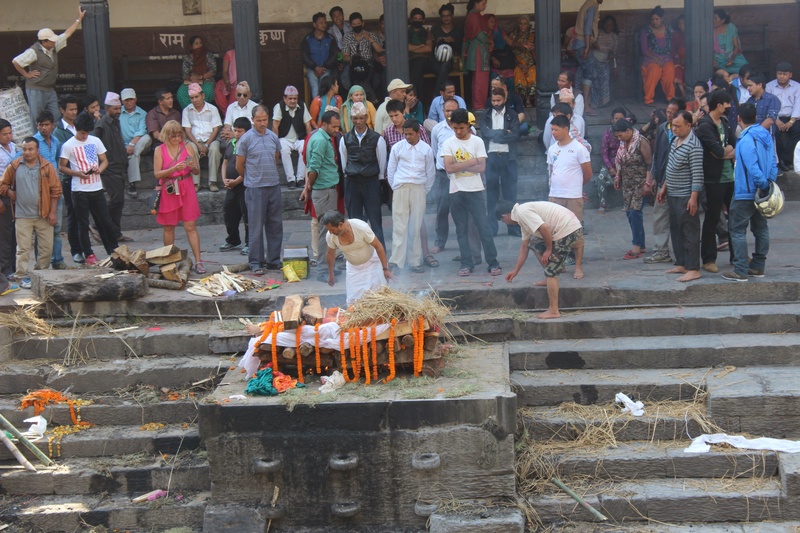 As it is in much of Nepal, the air is heavy with the smoke of rituals. 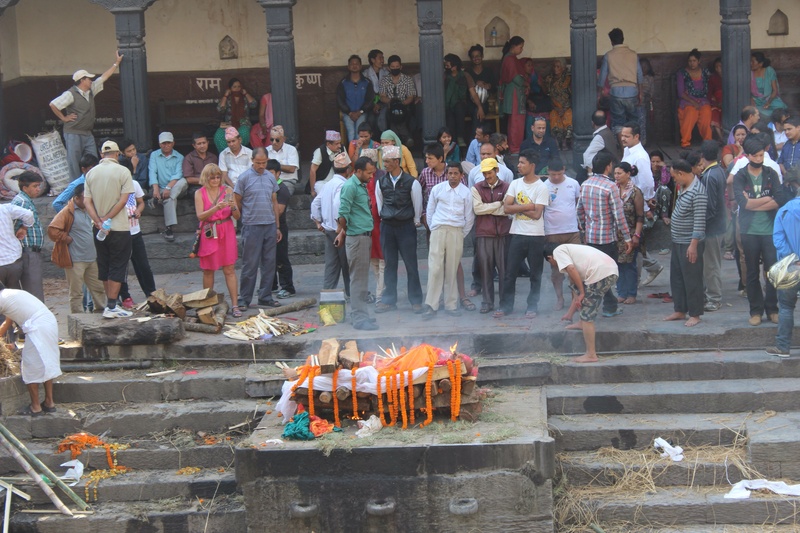 Incense, candles and butter burn everywhere as prayers are conducted to deities of both Buddhism and Hinduism. The dogs that run wild all over the city are often covered in butter from sleeping at the feet of alters and there is no exception here. There are many beautiful colors to be seen all around Nepal all the time, but the women are dressed in their best today. I watch as a monkey approaches a woman in a gorgeous pink and turquoise sarong. He tugs lightly on the end of it, causing her to raise her arms in surprise and drop the ice cream out of her cone. He then grabs the ball of ice cream and runs off as everyone laughs in surprise. Everyone is in a playful mood today.